I am within a screen, looking out at myself looking in on myself. In my ignorance I was shocked to discover the tablet I recently bought only had a one-way camera, meaning I can only photograph myself, easily. The whole “selfie” concept is in part what inspired this painting, though artists have been capturing themselves in this same way for centuries I feel unhealthily attached to my tablet since I bought it as a work tool and I think my portrait is an expression of that, of the way we are in a sense imprisoned by the technology we crave and create. I held it above my head to photograph myself then I painted the painting looking at myself on the screen for reference. Computer screens are difficult to see in sunlight, so we hide ourselves away in shaded rooms, our skin becoming pale and colourless. Maybe that’s why my skin is grey, ashen with the deprivation of the elements and the worry about the radiation and lit by the screen’s artificial light. My clothes however are acid and toxic in their chemical brightness. I wanted a clean private studio away from the detritus of children and animals, plants and mud, excrement and ash, the stuff of living. I have it now, and here I am sealed away in the sterile sealed vacuum of it, very much raised up above the primordial slime, engaged in the very modern act of self examination and introspection. But my thoughts always seem to stray back to the damage we as a people do to the earth and how we justify it in the name of art among other things. I am no exception. Every second we produce another gadget charged with the spurious task of improving our lives, but it may just be upping the chances of us getting cancer tenfold. Many people believe the continual manufacture of better and better machines will solve all the world’s problems, this I seriously doubt, but there is no stopping any of it. I am however torn between their siren-like, addictive wonders and the consequences, from the mining of the last of the rare earth metals to the children dying from inhaling toxic fumes as they melt the computers down for their valuable parts to the possibly irreversible poisoning of our environment. I am alive but maybe when I am attached to this dead thing I am only half alive, yet I can’t put it down. These were the thoughts going through my head as I painted myself and gazed down at the little black flat thing that contained me, trapped, flattened, looking up at myself through the glass screen. I won a place in the first round of Sky Arts ‘Portrait Artist of the Year Competition 2014’ with this painting and travelled to Edinburgh in July where the filming took place at the Museum of Scotland. Painting under pressure of time, in the presence of cameras and under the gaze of the general public. Many of the artists, including myself had to retrain for the competition, because of the time constraints and spent the months before filming painting as many portraits as possible. 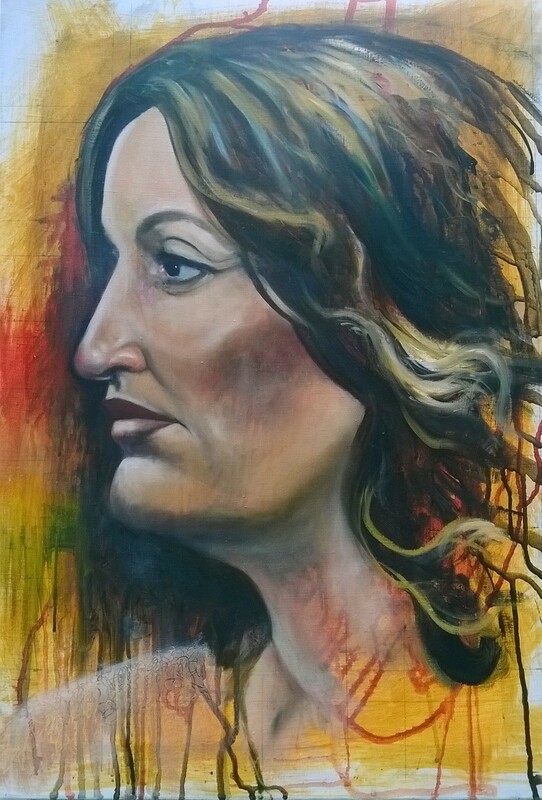 I was one of seventy two competitors from around the country, selected from over 1500 entries, who competed against 11 others in the regional heat at Edinburgh where I had four hours to paint a celebrity, whose identity was only revealed on the day. Five other heats in various locations around the country narrowed the field down to six in the second round and three for the final which took place in London. The winner received a prestigious commission to paint a highly prominent public figure to hang permanently in the Scottish National Portrait Gallery and £10000. The whole experience was pretty adrenaline fuelled. I had a panicky moment in the middle where I almost lost it but pulled it together enough to get the painting under control and finished. I got to quite enjoy the performance aspect of painting with an audience and found it changed my technique slightly, I took risks I might not have taken in private, like pouring ink on to the canvas at quite an advanced stage, because it was more visually exciting. The series “Portrait Artist of the Year 2014” started on Sky Arts on November 4th. The programme including me aired on the 18th November on Sky Arts 1. This is the portrait of actress Daniela Nardini that I painted in the 4 hours on the day. It is around 16″ x 20″ and is Acrylic and Oil on linen.